The Recreation and Parks Department administers an incredibly wide variety of programs. For senior adults, Recreation and Parks offers everything from low-impact choreorobics and yoga to bridge and ballroom dancing. Our athletic programs are second to none. We proudly offer empowering athletic programs like HOOPS and TOPSoccer for children with mental or physical disabilities. Adult softball games are played from April through June and September through November at Freedom Ridge Park using Amateur Softball Association rules and sanctioning. Dog obedience classes are instructed by the Jackson Obedience Training Club over nine weeks, teaching pet owners basic obedience commands. 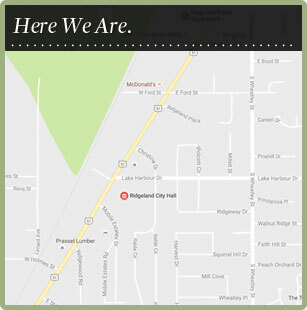 Ridgeland hosts the classes at the Ridgeland Recreational Center located at Old Trace Park. Ridgeland Recreation & Parks offers youth soccer programs in conjunction with the South Madison County Soccer Organization, a non-profit organization providing youth soccer under the guidance of the Mississippi Youth Soccer Organization. Fall and Spring sessions are offered. For more information, visit SMCSO online at www.smcso.com. Ridgeland Recreation & Parks offers youth baseball, softball and basketball programs in conjunction with the Madison-Ridgeland Youth Club. For more information, visit MRYC online at for baseball, and for softball. The Father-Child Fishing Tournament is held at Old Trace Park on the Ross Barnett Reservoir to celebrate Father’s Day. Hosted by Ridgeland during the months of September, October and November, Flag Football builds teamwork skills and teaches the basic fundamentals of football. This program is a national skills competition for boys and girls between the ages of 6 and 11. Established in 1961, the PPK program is the oldest NFL Youth Football program. HOOPS Basketball is a program designed for special needs children. Games are held in January and February utilizing volunteer coaches and assistants. This soccer program is offered to children ages 5 and up who are mentally and/or physically challenged. Registration occurs in the summer. TOPSoccer Jambore is designed for boys and girls ages 5-18 with special needs. This event provides a day of fun while teaching basic soccer skills. Challenger League is a baseball/softball program adapted for physically/mentally challenged youth. Monday, Wednesday & Friday’s, $10.00 per class, 9:00 – 10:00 a.m. & 10:00 – 11:00 a.m.
Mondays, $10.00 per class or $40.00 for a month. Beginners at 6:00 – 7:00 p.m. and Advanced at 5:00 – 6:00 p.m.
(Free) Tuesdays, 9:00 – 10:00 a.m.
(Free) Wednesdays, 9:30 – 11:00 a.m. A group of men who meet together for coffee, friendship and good conversation. Tuesdays & Thursdays, $10.00 per month, 10:00 – 11:00 a.m.
(Free) Tuesdays, 1:30 – 3:00 p.m.
Mondays & Fridays, $30.00 for 6 (30 minute) classes or $8.00 per class, 11:00 – 11:30 a.m.
Monday & Fridays, $30.00 for 6 (30 minute) classes or $8:00 per class, 11:30 – 12:00 p.m.
Tuesdays & Thursdays, $10.00 per month, 9:00 – 10:00 a.m.
Mondays & Wednesdays, $10.00 per month, 12:30 – 1:15 p.m.
Mondays & Wednesdays, $10.00 per month, 1:30 – 2:30 p.m.
Mondays, 2:30 – 3:30 p.m. & Thursdays, 5:30 p.m., $5.00 per class. Thursdays, $30.00 per month or $8.00 per class, 2:30 – 3:30 p.m.
(Free) 2nd & 4th Mondays, 1:30 – 3:00 p.m.
(Free) 4th Thursdays, 1:00 – 4:00 p.m.
1st Tuesdays of the month, September – May, 11:30 – 1:00 p.m., $20.00 per year. Fall-Proof Your Life/Tai Chi – 4 week class. Horticultural Therapy – 6 week class – each class is focused on a different way to growing plants & interacting with nature. Cupid will be aiming for your heart, and our program will be aiming for your funny bone at the Senior Adult Valentine Banquet. Delicious food, flowers and music, friends and fun await you. Our banquet is a big draw for seniors across the metro area. Ridgeland Recreation and Parks offers this special event every year on the Monday before Valentine’s Day. Call the office for details. A favorite event of local senior adults, the Mayor’s Fun Walk, includes a walk with the Mayor on the Ridgeland Multiuse Trail, health information, demonstrations and entertainment. This event is held in October. Senior Adults enjoy an afternoon of good food, fellowship and Thanksgiving during this annual event.